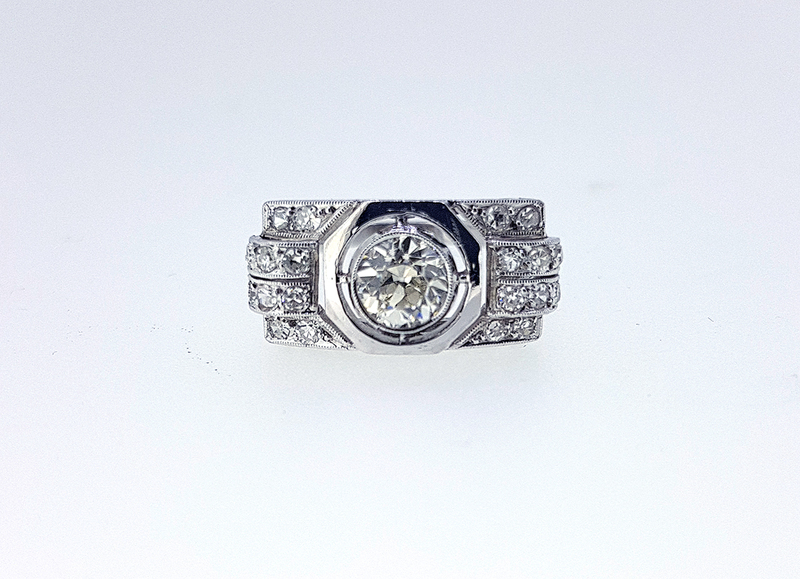 Absolutely lovely antique 1920s Art Deco diamond solitaire ring with diamond accents crafted in platinum. The very fine round old European brilliant cut diamond centerpiece is enclosed into a hexagonal shaped shooting target like design measuring 5.55x5.55x3.55mm within setting and has an estimated weight of about 0.75 carats. The diamond has a perfectly white H-I color and fantastic VVS2 clarity. There are further 20 smaller round diamond accents with average diameters of about 1.5-1.6mm and estimated combined weight of another 0.25 carats. All of the remaining diamonds have similar white color and average VS2-SI1 clarity. Total estimated diamond weight is about 1.00 carats. Ring size is 51-52 (US size 6, UK size L), but can be resized. Gross weight is 5 grams of platinum. Original and authentic 1920s piece in a perfect mint condition. Scarce antique jewelry collector piece and one of the rare 1920s Art Deco diamond solitaire rings and jewels.